Today I’d like to continue on the theme started in Finding suspect links and requirements to reconcile in Collaborative Lifecycle Management (CLM) 6.0 configuration management enabled projects by addressing another consideration from Enabling configuration management in CLM 6.0 applications. 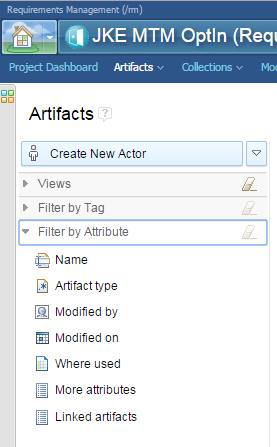 Do you need to filter views based on lifecycle traceability links? I’ll explore some alternative workarounds to these in this blog. 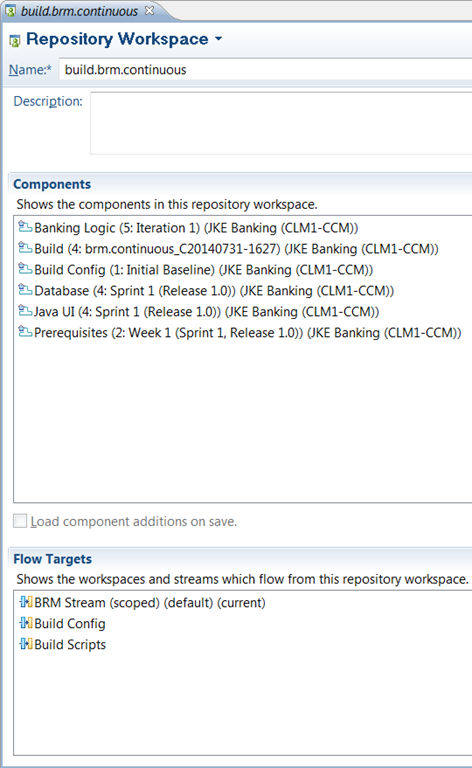 In CLM 5.x, views of requirements artifacts can be filtered by the status of lifecycle artifacts linked to them. The same is true in CLM 6.0 but only for projects that don’t have configuration management enabled. This limitation should be addressed in a future release by work item 97071. Below is an example showing all feature requirements with failed test case runs. 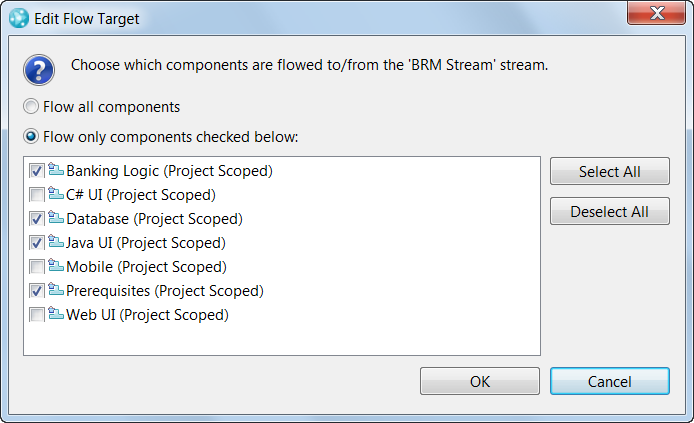 Similarly, the following shows all feature requirements whose linked development items have been resolved. In CLM 6.0, for configuration management enabled projects, the lifecycle status filter option doesn’t even appear. It is still possible to show a view of requirements with their lifecycle traceability links shown; it’s only the filtering that isn’t possible (at present). Here you could scroll through the Validated By column, for instance, and manually scan for test cases whose icon indicated a failure occurred. This wouldn’t be viable for more than a short list of requirements. What’s needed then is to display a view/query of the linked artifacts, filtered appropriately, and display, if possible, their linked requirements. For example, show all failed test case runs in Rational Quality Manager (RQM) and their associated requirements. When displaying all test cases, you can see visually by their associated icon, whether the test case has been run successfully or not. This isn’t ideal given you aren’t able to filter by the test case status and must instead visually pick out the failed runs. It does, however, show the linked requirement being validated. Alternatively, show a view of test case results and filter by their status. Below is a list of test case results that are Failed or Blocked and their associated test case. Unfortunately, it doesn’t also show the related requirement. Instead you would need to drill down into the test case from the failed run and see its linked requirements. Use of the Jazz Reporting Service Report Builder may be an option in limited cases. First, it’s use for configuration management aware reporting is Technology Preview in 6.0 and only really contains configuration data for RQM. For DNG, only the default configuration data is included for configuration management enabled DNG projects. If your requirements configuration management needs are basic, where a single configuration/stream is sufficient, this may be an option. 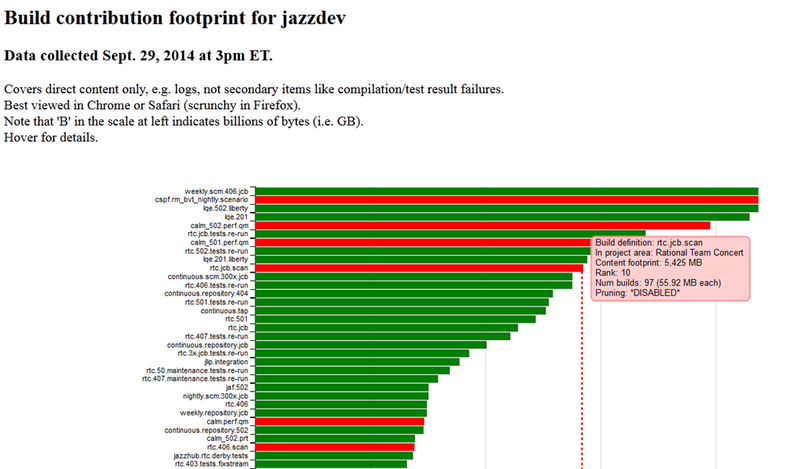 For example, the following report shows all requirements with failed/blocked test case runs. Now you’ll likely have multiple DNG projects. DNG doesn’t publish project area data to the Lifecycle Query Engine (LQE) using Configurations data source so you can’t choose only those requirements artifacts from a given project, limit scope by that project nor set a condition to query by some DNG project area attribute. 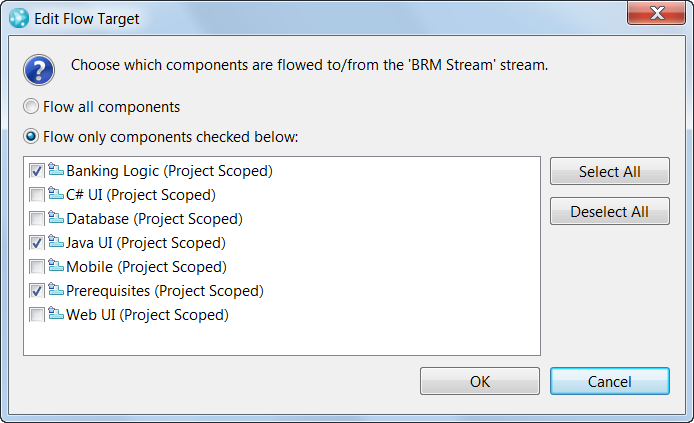 You can, however, choose test artifacts for a given project area (and configuration) so if there’s a 1:1 relationship between DNG and RQM projects, you can produce a report that just shows the requirements from failed test case runs in the desired RQM project belonging to the desired global configuration (this is what is shown in the previous screenshot). I tried looking at this from the opposite direction, that is, show all failed/blocked test case runs and their associated requirements. You get the right list of failed runs, but it shows all their associated requirements, not all of which were tested and failed in that run. For the other example I gave earlier, show all requirements whose linked development items were resolved, you could go to Rational Team Concert (RTC) and run a lifecycle query such as Plan Items implementing Requirements, but you’d need to visually look for plan items whose status met your criteria as the query isn’t editable and thus you couldn’t add a filter. In CLM 5.x, views of test artifacts can be filtered by the presence (or not) of a linked development item. The same is true in CLM 6.0 but only for projects that don’t have configuration management enabled. 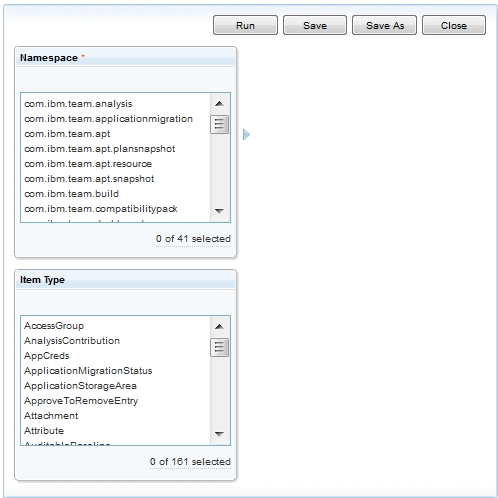 RQM projects that have configuration management enabled, don’t include that filter option. This limitation should be addressed in a future release by work item 134672. From this view, you would then need to visually scan the Test Development Item column for whichever condition you needed. RTC has some lifecycle queries, such as Plan Items with no Test Case or Plan Items with failing Tests that could help. Here again, Report Builder could help as you could construct a report that shows test cases with or without associated work items. For example, the report below shows test cases without any work item associated. In CLM 5.x, it is possible to link an RTC plan to a DNG requirements collection and/or a RQM test plan. Use of these grouped artifacts allows for shared scope and constraints across these lifecycle plans and are useful in auto filling gaps in plans or reconciling changes. In CLM 6.0, links to collections and test plans from an RTC plan only resolve to the default configuration in the project they reside in. In other words, you cannot link an RTC plan to a versioned requirements collection or test plan. This limitation should be addressed in a future release by work item 355613. The primary limitation that translates to is you are unable to auto generate workitems for requirements in a collection when working with projects that have configuration management enabled. Missing that capability then the only work around is to manually create the workitems so that every requirement in the collection is linked to a corresponding work item. 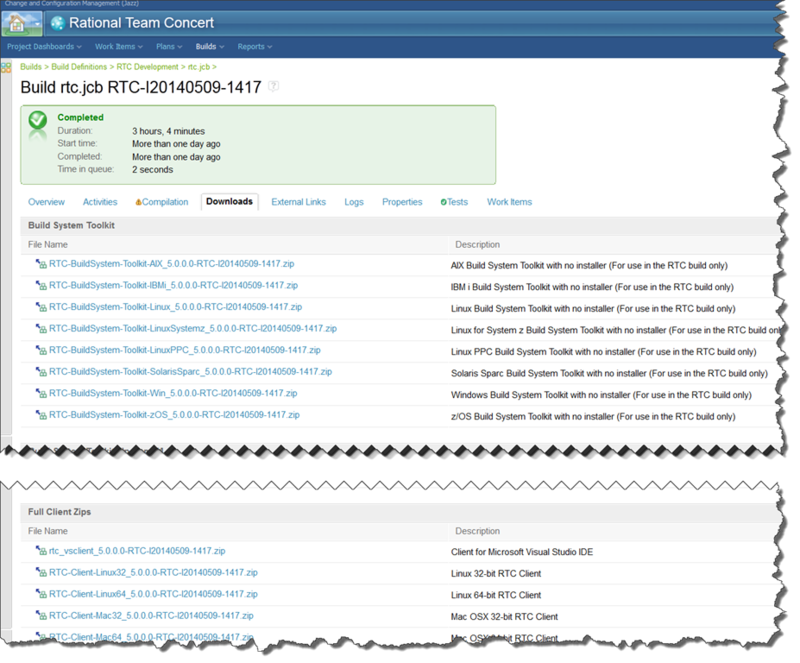 A traceability plan view in RTC that includes a color filter will help identify those plan items without requirements links. Such a view will highlight cases where a work item may need to be removed as the scope has changed, e.g. the collection has had requirements removed. In DNG, view the collection with the Implemented By column included and scan for requirements with no corresponding work item. If your requirements set is too large to view manually, export the collection view to a CSV file then open the exported file and filter or sort by the Implemented By column to more easily see those requirements without work items. Of the limitations discussed, I find the first one, inability to filter by lifecycle status, will be more problematic for customers though I’ve found it’s usage to be mixed. I’m also not particularly enamored with the workarounds described because they too are limited and involve some manual steps. I would be interested in hearing how significant these limitations are in your environment or if you have additional ideas on workarounds for them. Our team was asked recently how we go about getting access to the CLM software downloads. The primary answers were of course, the jazz.net product downloads while others use a ready made virtual or cloud image. I tend to support customers who are at different version levels. I also tend to want to run different versions of CLM natively. Some times I get the download from jazz.net, which is really the official channel (not to mention IBM Passport Advantage site). However, the typical download will involve use of IBM Installation Manager, which works great, but when you want to install multiple versions, you end up with multiple similarly named program groups. I choose a method which allows me to install from a zip archive. The point of this blog entry is not to advocate my method of getting the download. In fact I wouldn’t recommend it for any production deployment. What I want to do is use my method to illustrate some cool features of RTC that you can apply in your environment, not for getting our downloads but to allow others in your organization access to those you produce and to monitor progress along the way. As I said, I like to use the zip archive installs. This works for me since I don’t need an enterprise install and can typically get away with Derby and Tomcat. The jazz.net downloads have zip installs for the RTC client, Jazz Build Engine and a combined JTS/CCM but not a full CLM install (JTS, CCM, RQM, RDNG). If I want the zip install of CLM, I have to go elsewhere. Note once again, this scenario is for illustrative purposes only to highlight those capabilities and not promoting it as how you should go about getting your Jazz downloads. 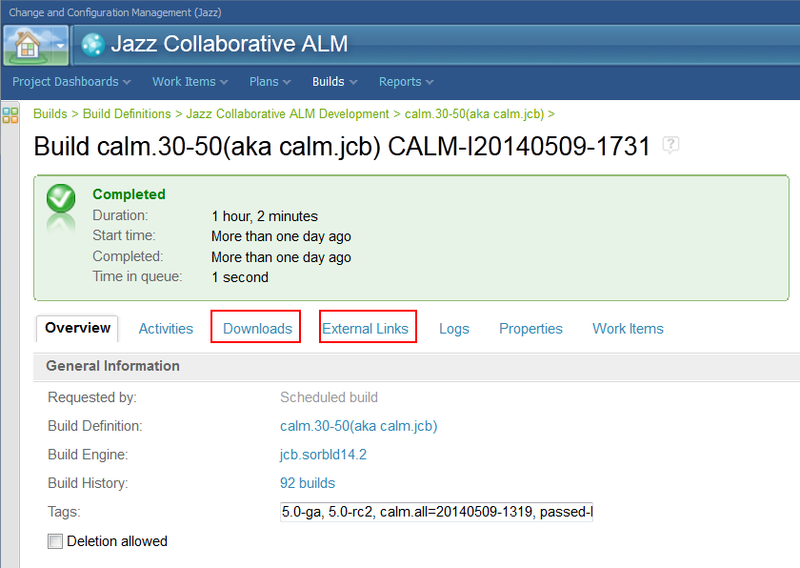 Firstly, I know that the Jazz CLM development team has a Jazz build definition to produce one of its releases. 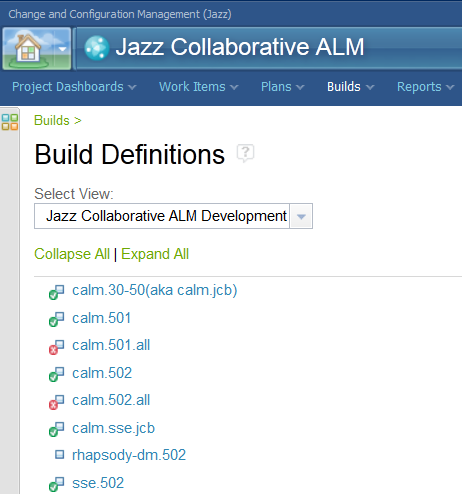 Using the Team Concert Web UI, I can browse the Jazz Collaborative ALM project area to see the list of build definitions for the project and in particular, the Jazz Collaborative ALM Development team area. 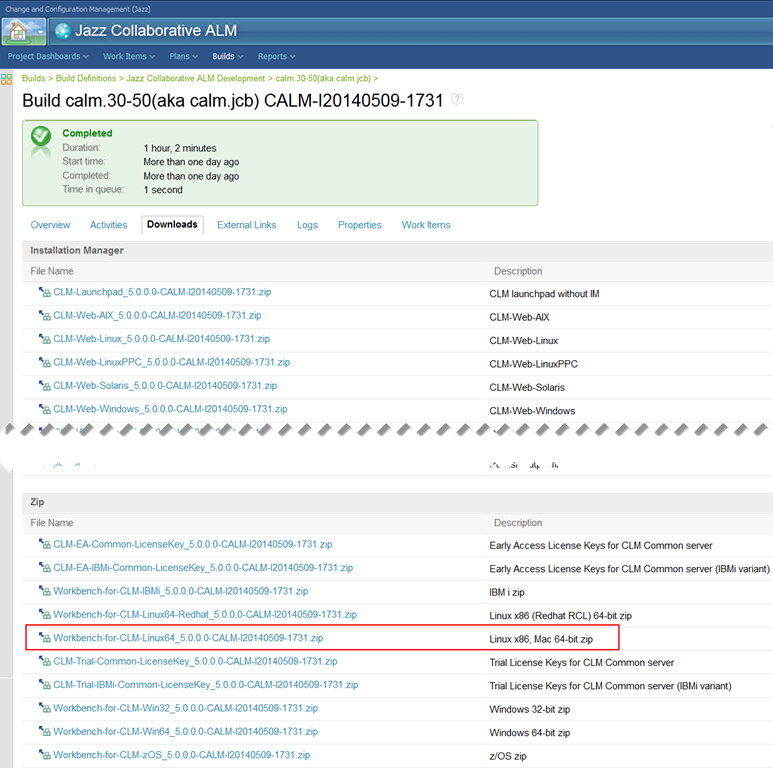 I select the build definition for the build producing the bits for the release I am interested, in this case, calm.30-50(aka calm.jcb) for the version 5.0 release I want. 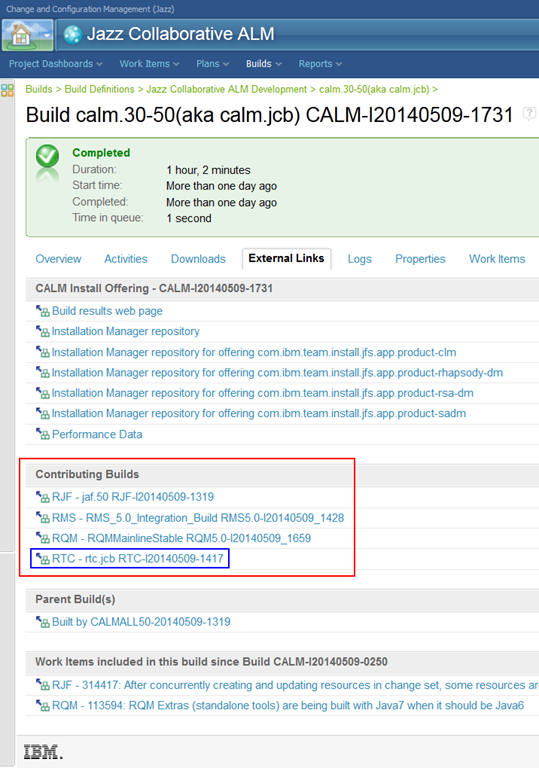 Note the list of most recent build results for the calm.30-50(aka calm.jcb) build. See the Tags column. RTC allows build results to be tagged. The development team uses tags for different purposes (e.g. passing a certain test stage) but one is to denote which build result is declared final for a particular milestone or release. Here I can see that build result CALM-I20140509-1731 completed successfully, is green, is tagged 5.0-ga and thus produced the final bits for the 5.0 generally available (GA) release of CLM. I select the result link to navigate to the CALM-I20140509-1731 build result. Of interest to me here are the Downloads and External Links tabs. The items on the Downloads tab represent artifacts produced by the build. 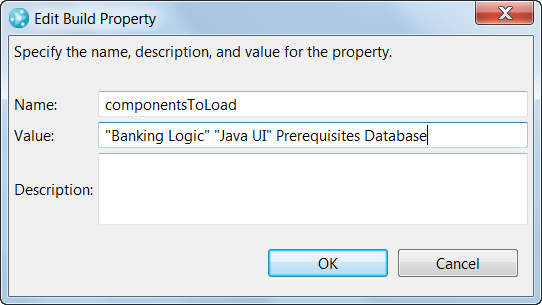 These can be published to the build result using the artifactLinkPublisher Ant task, available via the Jazz Build Toolkit. In this scenario, links to the various platform CLM Installation Manager installers and full CLM zip archive install are published with the build result. I want a 64-bit Linux install so I will select the Workbench-for-CLM-Linux64-Redhat_5.0.0.0-CALM-I20140509-1731.zip link. Once downloaded, I can expand the archive, navigate to the server folder and start the Jazz Team Server and go through the setup and import the appropriate licenses. This only gets me the CLM installation. I also want to get the corresponding RTC Eclipse Client and Jazz Build Engine. Since this is a GA release, I can get these from the typical jazz.net downloads page, but to further my illustration, I will use the External Links tab. On this tab, I see the list of contributing builds from other projects. 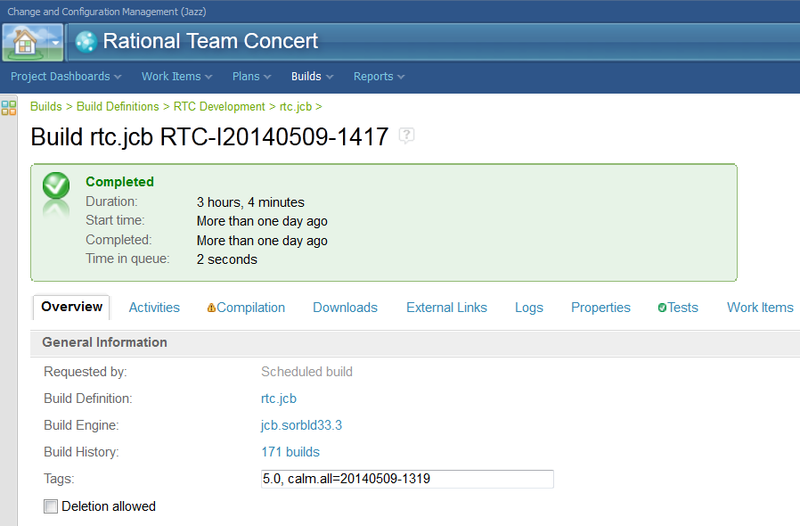 I am interested in the contributing build from the Team Concert project area, that is, RTC – rtc.jcb RTC-I20140509-1417. Note these links can be produced using the linkPublisher Ant task. Navigating to the result of the contributing RTC build, I see the build is tagged for 5.0 and has it’s own Downloads and External Links tabs. For my purposes, I am interested only in the Downloads tab so I can find the download link for the zip install version of the Build System Toolkit and Eclipse Client. Once downloaded, I can expand and run. One last feature, which is very useful if I am trying to get access to the milestone or release bits early or just to be aware of how we are progressing at declaring its final build, is the Track Build Item work item type. The development team uses these work items to collaborate across the teams and disciplines on the builds being produced, their contributors, schedule, test status, blockers found and finally, which will be designated as final/green for the milestone/release. 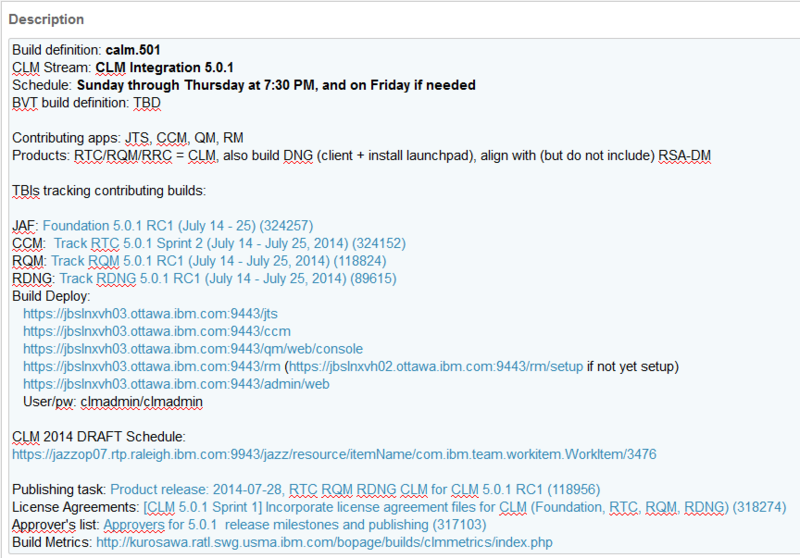 For example, the Track Build Item 324131 was used to track the CLM 5.0.1 RC1 milestone release. The description section tells me a lot of useful information about the release and its primary build and contributors. Looking through the discussion comments, I see a great deal of collaboration leading to green declaration of the final build. A build may be ready to be declared final but the team needs to coordinate on some approvals. The team is declaring the latest build as green and ready to move on to the next release. With all this useful information available, should I want to stay current on the release and pick and choose which builds to get early access to, I would subscribe to the work item and monitor the comments. In conclusion then, by browsing the build queues to find a build result that has been tagged then using the result’s Downloads and External Links, coupled with the Track Build Item work item, development teams have a powerful way to monitor and collaborate on builds throughout the release cycle and obtain their results. Do I need that other Jazz server? 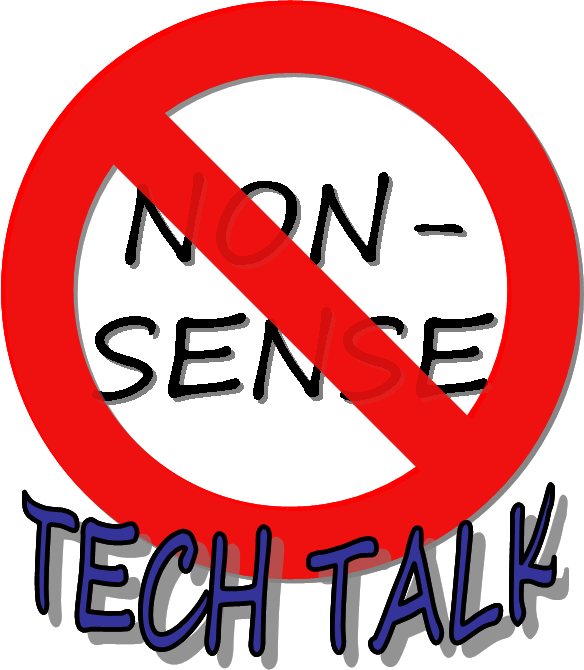 I have been working with a team trying to determine if they need a second Change and Configuration Management (CCM) server to support their Rational Team Concert (RTC) deployment. The performance of the existing CCM isn’t bad. While the CPU utilization is low, the memory consumption is peaking a little high so some monitoring would be helpful to understand the usage patterns more. The main motivation for considering a second CCM server is the expected growth to occur this year. They know their current average and peak license usage, current count of licensed/registered users and how many new registered users they expect to add. They also know the recommended range of users for a CCM based on IBM’s testing and analysis as shown in CLM Sizing Strategy. The slight disconnect is that the user ranges we recommend are based on concurrent users not how many registered users there are or how many on average have a license in use (checked out). Unfortunately, as yet, we don’t have a good way to measure the actual number of concurrent users. So what do we do? I see two ways to make this estimate. What you can then do is take a percentage of the current plus expected registered users, e.g. 20-25% above when spanning few time zones, and compare that to the RTC ranges based on workload. That will help you determine if another CCM (or more) is needed. The percentage you apply may be different based on your experience. In fact, in my customer case, a large number of users were registered and licensed in anticipation of them being migrated to RTC. Applying that percentage today would give them a higher number of estimated concurrent users than was being experienced. Another method would be to look at the average/peak number of licenses in use for RTC vs those that are licensed. From this ratio, assuming linear growth, you can project how many licenses would be in use in the future. Again, you would then compare that to the recommended ranges. This method should be a little more accurate than the anecdotal, gut feel percentage of registered users in the first method. We at least know that the number of concurrent users isn’t any more than the number of licenses in use. Based on what you know of the users to be added, linear growth may not be quite right and you may need to adjust the projection (e.g. the users being added are expected to be heavier users of RTC). This latter method is what we used. It seemed more accurate plus, as mentioned, the number of licensed users included many who weren’t onboarded yet. 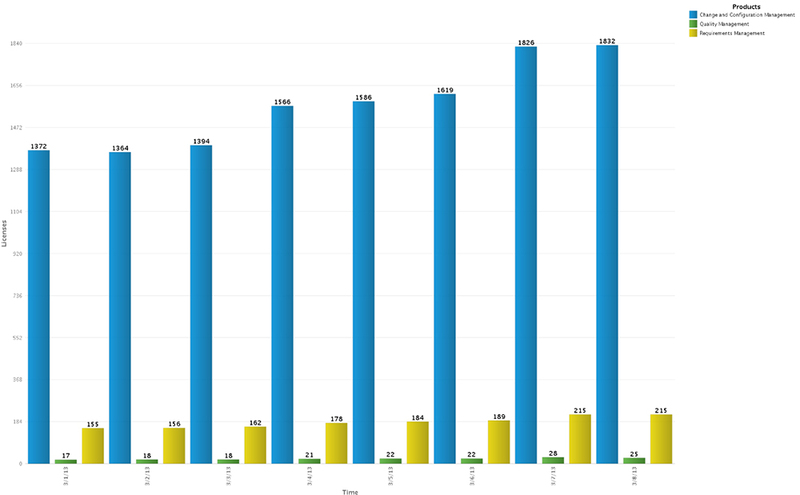 Now the CLM Sizing Strategy is based on the workloads we generated on a given set of hardware. Your workload and hardware may be such that you can handle more users (or maybe less). I’ve had customers report that they were able to support more users than our recommended ranges. 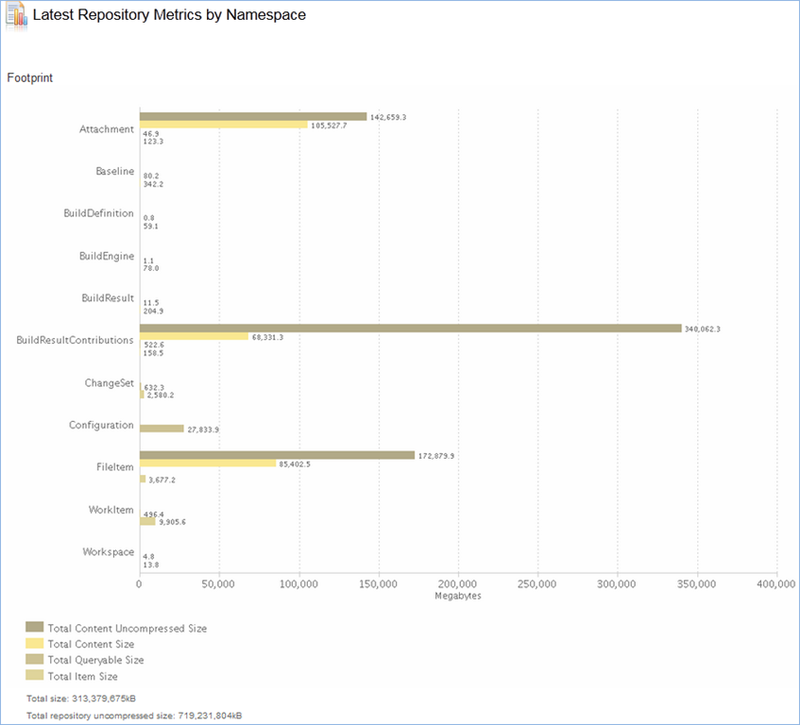 This then shows that all the numbers and percentages need to be balanced against real experience with the environment, not only the license usage data but other things like CPU utilization, JVM size, database size, etc. Monitor your current environment and perform trend analysis to assess if the server is nearing capacity. Look at Monitoring: Where to Start? and Monitoring and Troubleshooting Guide for IBM Rational Collaborative Lifecycle Management (CLM). Note that using the built in Jazz server license usage reports or the Rational License Key Server Administration and Reporting Tool, one can get an idea of license usage trends. For example, the reporting tool will show license usage by product. The recent release now includes support for authorized licenses. Support for showing reports by role is being considered for a future release. As mentioned in the beginning, in this customer’s case, they weren’t experiencing any performance issues with the server. Their CPU utilization looked fine. There were memory usage peaks hitting 80% – 90% of the total heap so I suggested monitoring this and increase the heap as needed. In the end, though the straight numbers and percentages suggested additional servers would be needed, this customer didn’t have good monitoring data, wasn’t experiencing performance issues and seemed to have capacity to support more users. My recommendation was to hold off on a topology decision, put some monitoring in place, adjust the server configuration as needed/able (memory, JVM, CPU (number, speed)), assess performance/capacity of server vs expected users yet to add, if capacity/performance can’t be adjusted by manipulating the server configuration and it looks like the growth will be more than the server can handle, then add the additional CCM. We didn’t want to take the addition of the second CCM lightly because doing so would incur another set of issues, that being the behavioral differences between a single CCM environment and a multiple CCM environment that I’ve blogged about previously and documented on the deployment wiki. 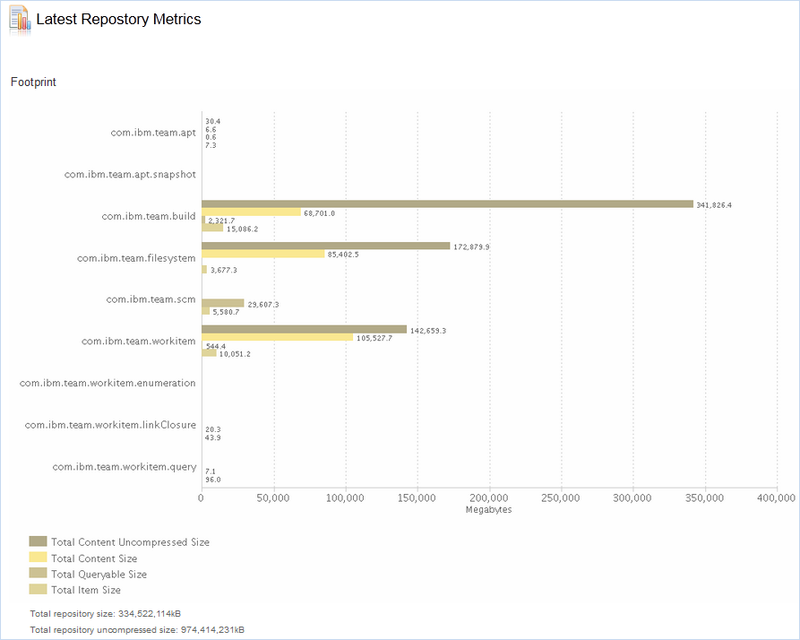 See Planning for Multiple Jazz Application Server Instances. When assessing whether a multiple CCM topology was needed, one consideration we made was whether to mitigate some of the primary behavioral differences of concern to the customer by making one CCM be the hub for all work items and planning and the other CCMs for source control and build only. There are tradeoffs for sure but that’s another blog discussion for another time.